Take away their PlayStations, iPads and cell phones and take the kids to the 300-acre Hull-O Farm on a vacation that will bring them closer to the real world of hard work and that will help you reconnect as a family. They will get to play with the puppies, kittens, baby chicks, tiny goats, and fluffy rabbits. They can climb a pile of hay, get lost in a corm maze, or stumble through the pumpkin patch. Read More. Hull-O-Farms welcomes guests from Memorial Day through October. Families sleep in one of three quaint private guest cottages. 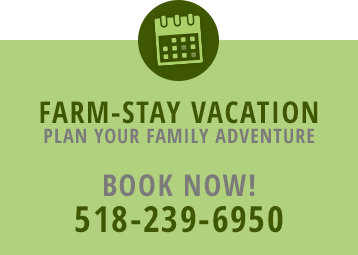 A stay includes an all-you-can-eat breakfast, hayrides, campfire with s’mores, fishing in the pond, and farm explorations galore. Farm activities include milking cows and goats, gathering freshly laid eggs, learning how to feed the baby animals, and mending fences. In-season, there is a corn maze. Nearby you’ll find a water park (Zoom Flume), horseback riding, and the famous Howe Caverns to explore. Read More. Ratty takes a trip to real working farm for a fun, family vacation! I LOVE NEW YORK at Hull-O Farms! Say hello to our new friends from the Catskills! Visit Hull-O Farms and Rosemary Farm for more. Visit the Catskills: Animal AdventureSay hello to our new friends from the Catskills! Visit Hull-O Farms and Rosemary Farm for more. Hull-O Farms on the Today Show! Lester Holt, Erica Hill, Jenna Wolfe and Dylan Dreyer from the Today Show spent a day at our farm to see what it’s like working on a farm! Hull-O Farms on CBS News! Watch this video to learn about our history and the entire story about Hull-O Farms vacations.